Engraving of columns in the fortress of Chittaurgarh by Edward Francis Finden (1791-1857) and Ghasi (fl. 1820's). Plate 22 of James Tod's 'Annals and antiquities of Rajast'han or the Central and Western Rajpoot States of India' published in London in 1832. In 1818 Mewar and other princely states signed a treaty with the British and Colonel James Tod became the first Political Agent to the Western Rajput States. Along with his official duties, Tod became very interested in the genealogies of the Rajput Kingdoms as well as the art they produced. Chittaurgarh, located 110 km east of Udaipur, is the location of the hilltop Chitor Fort, the site where Emperor Akbar (r. 1556-1605) attacked the Rajput rulers of Mewar in 1567 forcing them to abandon the site and relocate to Udaipur. Within the fort there are numerous ruined palaces, towers and temples. 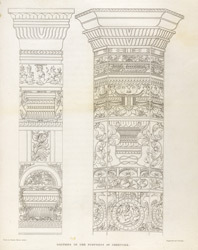 This view shows two elaborate columns carved with floral motifs and a medallion with figures inside.